Approximately seventy five miles to the north of the Fort Gratiot Light, a shallow reef with only two feet of water above its outer end protruded from the shore a full two miles into Lake Huron's waters. While such a reef would have been a hazard to vessels coasting the western Huron shore under the best of circumstances, it's location was particularly egregious, as it stretched across the exact point at which northbound vessels began their westerly swing into Saginaw Bay. Taking up the cry from maritime interests to mark the hazardous reef, on February 19, 1838 Michigan State Representative Isaac Crary entered a motion in Congress that the Committee on Commerce be instructed to investigate into the expediency of establishing a lighthouse on the nearby shore to both warn mariners of the reef and to mark the important turning point into Saginaw Bay. After investigation, the Committee concurred, and Congress responded with an appropriation of $5,000 for the Light's construction on July 7, 1838. 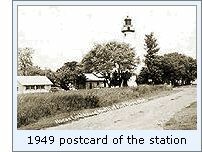 While conducting his annual inspection of lighthouses on the lakes and selecting sites for proposed new stations a month later, Lieutenant James T Homans arrived in the area to select the site for the new station. In his report to the Fifth Auditor of the Treasury for the year, Homans reported that he selected "the most westerly of the two points, known as Point-aux-Barques, near the entrance to Saganaw Bay (sic), for the light there, because it is sooner seen by vessels approaching from the northward and westward, by which it will be most used; also, as being near a shoal, dangerous to the navigation of its vicinity." Homans went on to report that "There is stone in considerable quantity near this location, which can be used in constructing the buildings. The land, I presume, belongs to the Government, or can be had for a moderate price, there being no settlements within several miles, and the soil very barren." Construction of the lighthouse was not completed until 1847, with the light not exhibited until the opening of the following season of navigation. Peter L. Shook was appointed as the station's first Keeper, and is listed in payroll records as arriving at the station on March 6, 1848, and thus it is likely he exhibited the Pointe Aux Barques Light for the first time soon thereafter. We have thus far been able to determine very little about the structures that originally made up the station. However it is likely that they were similar in design to other early stations built during the period, consisting of a squat stone tower outfitted with a Lewis Lamp array, and a small detached dwelling of either brick or stone. Peter Shook passed away on May 15 of the following year, and his wife Catherine appointed as Keeper on his death. Evidently Catherine took well to lighthouse keeping, as Henry B Miller, the Superintendent and Inspector of Lights for the Northwest Lakes inspected her station on July 2, 1850 and reported everything to be in "passable order" and the "conduct of the Keeper good." However, it would appear that the work quickly took its toll on Catherine, as she resigned from lighthouse service on March 19, 1851, to be replaced by Francis H Sweet. As was frequently the case with most of the early lighthouses built on the Great Lakes, the quality of construction and materials used in the original structures were marginal, and with the diminutive tower no longer deemed an effective adequate guide to the increasing maritime commerce into Saginaw Bay, the decision was made to destroy the old structure and to erect both an improved tower and dwelling. The contract for the new station was awarded to Milwaukee contractors Sweet, Ransom and Shinn in 1854, who were simultaneously awarded contracts for building a number of lighthouses on the Great Lakes, including the LaPointe Light on Lake Superior, which was erroneously erected on Michigan Island. Plans for the new Pointe Aux Barques station called for a Cream City Brick tower standing 89 feet from the foundation to the top of the lantern ventilator ball. The lantern was outfitted with a Third Order Fresnel lens which exhibited a characteristic fixed white light varied by a bright a white flash every two minutes. To impart the desired characteristic, the lens was outfitted with bulls eye panels and was situated atop a cast iron pedestal. A clockwork motor rotated the lens around the lamp at an exact rotational speed which placed the bulls eyes between the mariner and the lamp every 2 minutes, creating a bright flash. With the tower constructed atop a twelve foot high bluff at the point, the lens stood at a focal plane of 93 feet above lake level, and was visible for a distance of 16 miles at sea. The two story dwelling was attached to the tower by way of a covered passageway, outfitted with an arch topped cast iron door at the tower end to stem the possible spread of fire between the two structures Work on the station was complete and the Third Order Fresnel exhibited for the first time on an unrecorded evening in 1857, and no longer serving any purpose the old tower and dwelling were demolished. After three years, the bluff on which the station was constructed was found to be deteriorating, and a revetment was installed at the water line to serve as a protection from the waves. While the appointment of Assistant Keepers was frequently reserved for offshore stations and those with fog signals, the decision was made to add an Assistant at the station, with Mr. G Dodge arriving to fill the position with the opening of the navigation season in 1859. By 1867, the town of Port Huron 75 miles to the south was growing rapidly as a major maritime and railway transfer point. With the number of lights around the railway depots close to the Fort Gratiot Light increasing, mariners seeking the entrance to the River were concerned that the fixed white light at Fort Gratiot might be confused with the locomotive headlights in the area. 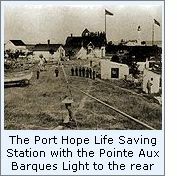 To eliminate the possible confusion, the flashing lens from Pointe Aux Barques was removed and shipped to Port Huron, where it was installed in the Fort Gratiot lantern. 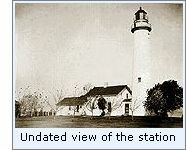 On completion of the installation, the fixed Third order lens from Fort Gratiot was in turn shipped to Pointe Aux Barques where it was installed in that station's lantern. Also in this year, it was noted that large trees were encroaching on the lighthouse reservation, and that they would need to be removed before visibility of the light was compromised. While the decision to swap lenses with Fort Gratiot solved the problem at the southern station, it was evidently not deemed as acceptable as a long term solution to mariners navigating in and out of Saginaw Bay, as Senator Zachariah Chandler presented a petition signed by concerned vessel masters before the Senate on February 7, 1872 requesting that the characteristic of the Pointe Aux Barques be changed back to a flashing light. Unfamiliar with the intricacies of navigational issues on the distant lake, the mater was referred to the Committee on Commerce for analysis. Evidently the Committee on Commerce concurred with the spirit of the petition, for the Third Order Lens at Pointe Aux Barques was again replaced the following year with a flashing white light showing its flash every ten seconds. With an expansion of the Life Saving Service throughout the lakes, 1875 saw the establishment of the Port Hope Life Saving Station on the lighthouse reservation some 800 feet to the south of the tower. Constructed to a plan drawn by Life Saving Service Engineer Francis Chandler, the building was particularly beautiful, with diagonal bracing on the exterior walls and intricate bracketing supporting the overhanging eaves. Captain J. H. Crouch was appointed as the Keeper of the new Life Saving station, and it is likely that lighthouse Keeper Andrew Shaw appreciated having the Life Savers close by, as it would have provided him the opportunity for a little socialization beyond his family previously unavailable on the isolated point, and as a Federal employee he likely enjoyed the availability of a peer's shoulder on which to complain about government pay rates and regulations! 1881 was one of the driest summers on record, and a wildfire sprang up and raged out of control in Michigan's Thumb area. Driven by westerly winds, the fire made its way inexorably toward the Huron shore, with both the Port Hope Life Saving Station and Pointe Aux Barques Light standing directly in its path with their backs against the shore. Keeper Shaw nervously watched as the fire approached from the east, fearing both for the safety of his Light and his family farm a mile to the north. Shaw and the Life Savers fought valiantly to keep the fire from the tower carrying water from the lake in every container they could lay their hands upon. With the fire at the lighthouse under control, they then turned their attention to Shaw's farm. Arriving to find the buildings and crops completely obliterated, Shaw was no doubt elated to find his family had some how made it through the ordeal unscathed. On their return to the lighthouse, they found the wind had shifted, with the flames now threatening the Life Saving Station. A bucket brigade was formed and the shingle roof was wetted-down to prevent ignition by errant sparks. Finally the wind shifted offshore, pushing the fire back on itself and out of the area. One can only imagine the relief that must have been felt by all involved after such a fight for both their lives and their livelihoods. A work crew arrived at the station in 1884 and drilled and blasted a well 19 feet through the rock to supply water to the lighthouse. 1891 saw the construction of a woodshed for the Keeper's use, and the following year, the materials for a round iron oil storage shed were delivered at the Detroit depot. The materials, along with a work crew, were delivered at the station aboard the lighthouse tender AMARANTH in 1893, with the shed was erected a short distance to the south of the tower. While fogs in the area were not considered worthy of the erection of a first class steam fog signal at the station, an automated fog bell was installed at the station in 1899 to be operated during periods of thick weather. At the close of the 1900 season of navigation, the District Lampist arrived at the station, disassembled the Third Order lens and took it to the lamp shop at the Detroit Depot, where it was completely overhauled during the winter, and then returned to the station on the opening of the 1901 season of navigation. With the turn of the twentieth century, it was realized that the single dwelling provided for the Keeper and his Assistant at the Point Aux Barques station was wholly inadequate, and plans were drawn up for the erection of a second dwelling. Built on the same plan as structures concurrently being planned for Munising and Grand Marais, work on the new dwelling began at the end of May, 1908, with the blasting of the cellar and sewer line to the lake. By the end of June, blasting was complete and the foundation had been built to ground level. Work progressed rapidly over the following months, and was brought to completion on August 7, with then Head Keeper Peter Richards taking up residence soon thereafter. After construction of the new dwelling, things remained fairly uneventful at the station, with only general ongoing maintenance and minor changes being undertaken. The illumination was upgraded with the installation of an incandescent oil vapor lamp system (IOV) on June 28, 1914. Without change in characteristic, the installation represented a significant upgrade in the light's visibility as the light's intensity was increased to 34,000 candlepower and its range of visibility to 18 miles at sea. A lighted bell buoy was placed in 36 feet of water 2 ¼ miles offshore to mark the eastern extremity of the reef on May 22, 1918. Consisting of a cylindrical float with a skeletal superstructure supporting a ten candlepower light ten feet above the water, the light was fueled by an acetylene system and the bell operated by wave action. Designed to carry enough acetylene to power the light for almost the entire season of navigation, the buoy was taken up at the close of the season of navigation each year by the lighthouse tender AMARANTH, and taken to the Detroit for maintenance and painting, and then replaced at the opening of navigation the following year. 1932 saw the electrification of the station and the installation of an incandescent electric bulb within the Third Order Fresnel lens, providing a further increase in output to 120,000 candlepower. At this time, the characteristic flash rate was also changed to exhibit a 3 second flash followed by a 7 second eclipse. With electrification and Coast Guard's assumption of responsibility for the nation's aids to navigation in 1939, the way was paved for complete automation. At some time in the early 1950's, the Third Order Fresnel was disassembled and crated-up for storage and replaced with twin DCB-224 aero beacons with automatic bulb changers, which were installed on the old cast iron pedestal. Emitting two 5-second flashes followed by a 20-second eclipse. No longer needing to maintain a presence in the area, the Cost Guard removed its crew from the station, and mothballed the building, making only infrequent trips to the tower to service the DCB-224's. The lighthouse reservation was sold to Huron County in 1958 to be operated as a park, campground and lighthouse museum, in which capacity it continues to operate to this day. The station's venerable Third Order Fresnel lens was displayed at the Grice museum in Harbor Beach for a number of years until that museum obtained the Fourth Order lens from the Harbor Beach Breakwater Light. The Third Order lens was subsequently moved to the Huron City museum, where it is displayed to this day, along with a fog bell that also likely came from the Pointe Aux Barques station. Click here to see a complete listing of all Pointe aux Barques Light keepers compiled by Phyllis L. Tag of Great Lakes Lighthouse Research. Located in the county park 10 miles east of Port Austin. The park features a beautiful campground and many picnic areas. The lighthouse museum is open daily from Memorial Day through Labor Day from 12:00 p.m. - 4:00 p.m.
USCG Historian's Office - photographic archives. Photographs from the author's personal collection.